Can Weight Loss Pills Help Me Lose Weight Fast? 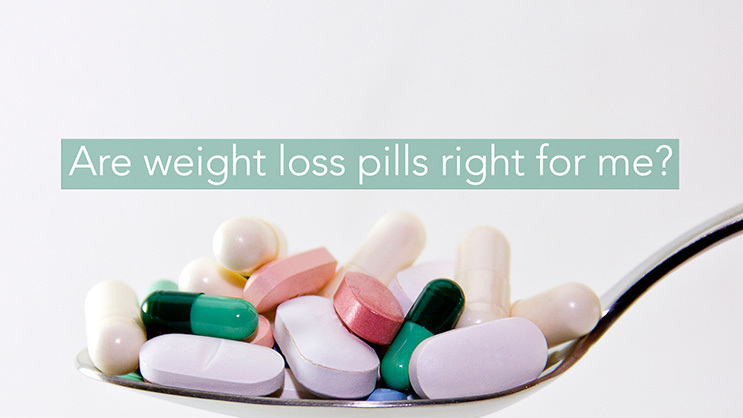 While there’s no “magic pill,” there are weight loss medications that are effective, safe and can help you achieve your weight loss goals. These medications don’t melt fat or shed inches; there are no pills that can target weight loss in specific parts of the body. In fact, most weight loss medications don’t even work in the intestines or the stomach—they work in the brain. If you’re interested in learning if weight loss medication is right for you, call Columbia University’s Comprehensive Obesity and Metabolism Management (COMMiT) program at (212) 305-4000 to request an appointment to learn more about your weight loss options. Naltrexone-Bupropion (known under the brand name Contrave) targets a part of the brain called the hypothalamus that helps your body regulate hunger. While it remains unknown exactly how this medication works to promote weight loss, it does lead to a decrease in appetite1. In one trial2, 42% of people who used the drug along with diet and exercise, lost at least 5% of their body weight in a year, compared with 17% of those who used diet and exercise along with a placebo (inactive) pill. Orlistat (known under the brand names of Xenical and Alli over-the-counter) is the only weight loss medication that works in the intestines. It blocks 1/3 of the fat (and the calories that come with it) in meals from being absorbed by the body, which led to >5% weight loss in 65% of patients taking orlistat when combined with a reduced-calorie diet and exercise in a clinical trial,6 compared with 43% of patients on a placebo pill with diet and exercise alone. While these studies show that diet and exercise are important, medications can help increase the amount of weight that you lose and may be a helpful addition to your weight loss program. So are weight loss pills right for me? Weight loss pills aren’t for everyone. Your Body Mass Index (BMI), a measurement based on your height and weight, which is used to estimate body fat, can help you figure out if medications may be an option for you. (Find your BMI with this BMI Calculator). If you have a BMI of 30 or higher, or if you have a BMI between 27-30 and have also developed health conditions brought on by weight, like high blood pressure, diabetes or heart disease, then weight loss medications may make sense as part of your weight loss strategy, along with a healthy diet and exercise. It’s important to remember that everyone is different and will lose weight in different ways. You can learn more about which weight loss option may be best for you at COMMiT: the Comprehensive Obesity and Metabolism Management and Treatment program at Columbia University Medical Center. Call us at (212) 305-4000 to request an appointment to learn more about your weight loss options. U.S. Food and Drug Administration. FDA approves weight-management drug Contrave. 2014 Sept 10; Available at: http://www.fda.gov/NewsEvents/Newsroom/PressAnnouncements/ucm413896.htm. US Food and Drug Administration. FDA approves Belviq to treat some overweight or obese adults. 2012 June 27; Available at: http://www.fda.gov/NewsEvents/Newsroom/PressAnnouncements/ucm309993.htm. Pi-Sunyer, Xavier. Et al. A Randomized, controlled trial of 3.0 mg of Liraglutide in weight management. N Engl J Med 2015; Available at: http://www.nejm.org/doi/full/10.1056/NEJMoa1411892. Shin, Jin Hee. Gadde, M Kishore. Clinical utility of phentermine/topiramate (Qsymia) combination for the treatment of obesity. Diabetes Metab Syndr Obes 2013; Available at: http://www.ncbi.nlm.nih.gov/pmc/articles/PMC3626409/. Davidson, MH. Et al. Weight control and risk factor reduction in obese subjects treated for 2 years with orlistat: a randomized controlled trial. JAMA 1999 Apr 7; Available at: http://www.ncbi.nlm.nih.gov/pubmed/9918478.